Performers include: Jack Paar, Betty Clooney, Johnny Desmond, Clark Dennis, Edie Adams, Jack Haskell, Pupi Campo’s Orchestra, and Jose Melis and his trio. This variety show began as an hour-long daytime program and aired for approximately 160 episodes, until July 2, 1954. After that, it moved to primetime (starting July 17, 1954) and ran for eight half-hour episodes. It was a summer replacement series for My Favorite Husband. Each episode of this series features Paar performing a monologue, chatting with guest stars, and performances by his regular singers. Jose Melis also appears on this series. He would later work with Paar when he moved to NBC for Tonight starring Jack Paar (one of the many iterations of The Tonight Show). No details are available about the last episode. First aired: September 4, 1954. At the end of this series, Paar started serving as part-time host of The Morning Show, an early version of CBS’ current morning talk/news show. 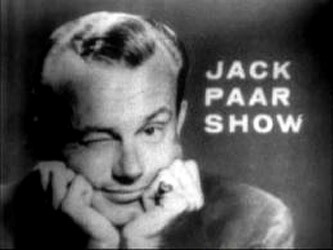 This Jack Paar Show shouldn’t be confused with NBC’s Tonight starring Jack Paar, which was sometimes marketed as The Jack Paar Show.